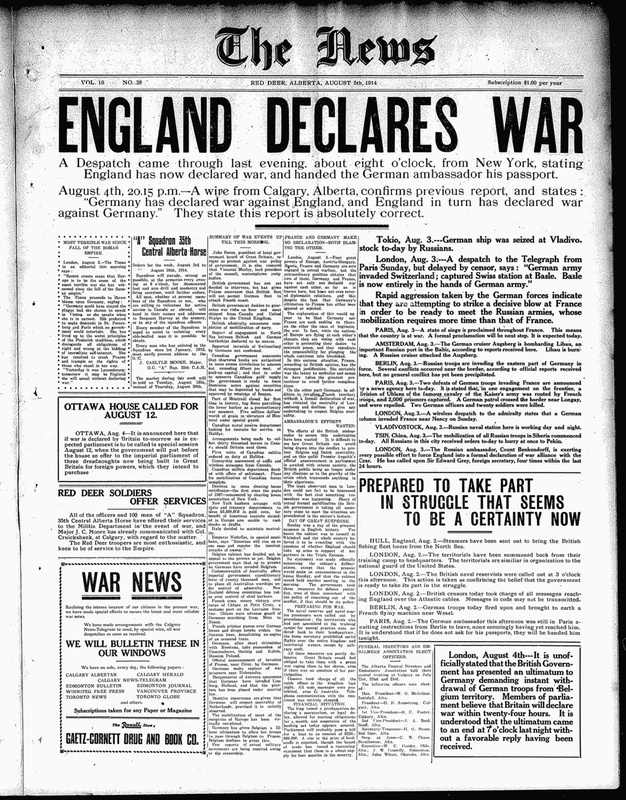 3 August 1914: Two days after declaring war on Russia and just one day after the French mobilization, Germany declares war on France. Several hours later, France declares war on Germany and begins to transport troops to the territories of Alsace and Lorraine, which France had ceded to Germany in 1871. Meanwhile, Germany continues its troop buildup along the Belgian border, which it aims to march through on its way to France. The threat to Belgium’s sovereignty is what will bring Great Britain into the war. 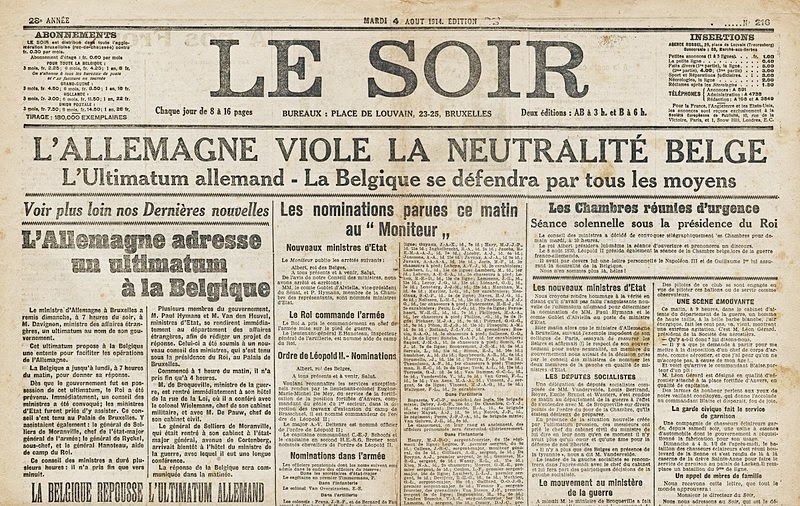 The day before, Germany had presented Belgium and its sovereign, King Albert, with an ultimatum demanding passage for the German army through its territory. This threat to Belgium, whose perpetual neutrality had been mandated by a treaty concluded by the European powers—including Britain, France and Germany—in 1839, united a divided British government in opposition to German aggression. 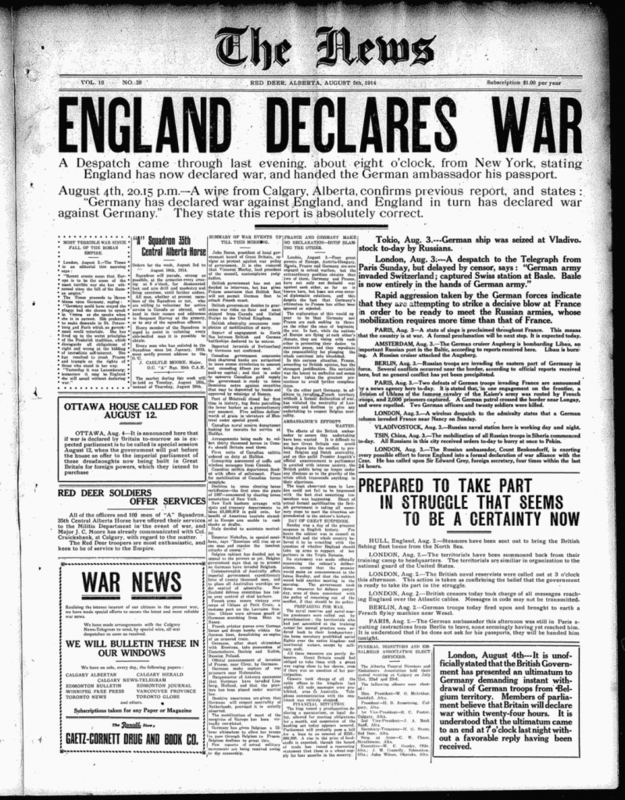 Hours before Germany’s declaration of war on France on August 3, the British foreign secretary, Sir Edward Grey, went before Parliament and convinced a divided British government—and nation—to give its support to Britain’s entrance into the war if Germany violated Belgian neutrality. “The lamps are going out all over Europe; we shall not see them lit again in our lifetime,” Grey famously remarked to a friend on the night of August 3. 4 August 1914: Germany makes a major strategic miscalculation by not only ignoring Britain’s ultimatum but attacking both Belgium and France. The next day, Britain sent its own ultimatum to Berlin: halt the invasion of Belgium or face war with Britain as well. A reply was demanded by midnight that night. At noon that day, King Albert finally made a concerted appeal for help to France and Britain, as guarantors of Belgium’s neutrality according to the Treaty of 1839. To do so earlier, to call in the French and British too soon, would have risked violating his country’s neutrality before Germany had done so. When London received no answer to its ultimatum—the first German troops had in fact crossed the Belgian frontier at Gemmerich, 30 miles from the fortress city of Liege, that morning—Britain declared war on Germany. Germany declares war on Belgium at 6am and invades at 8am. Much further south, German cruisers Goeben and Breslau fire on the Algerian ports of Bona and Philippeville. The Goeben retreats once under fire from the fort of El Kantara but not before killing twenty-one people, including four civilians. In Lorraine, German troops seize Trieux. At 11pm, Britain and Germany are officially at war. 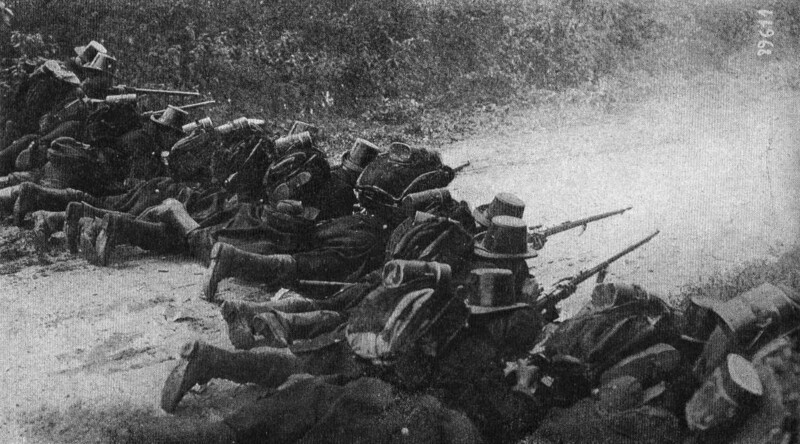 Below: Belgian troops defend Liege. 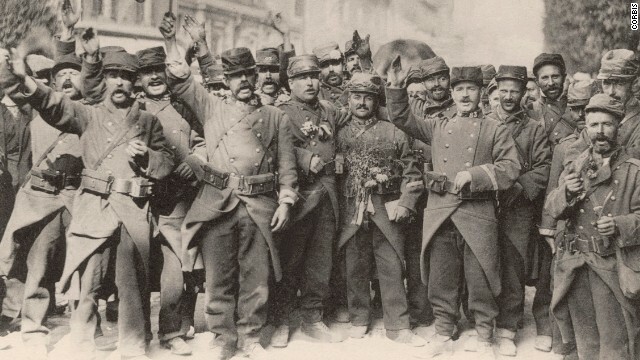 Below: Meanwhile, French soldiers are showing their enthusiasm. 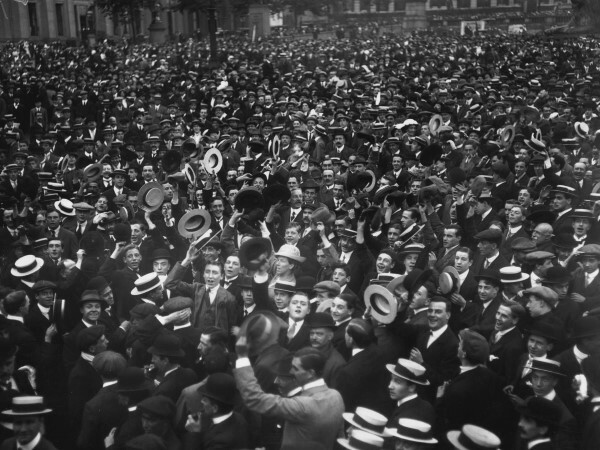 Below: Trafalgar Square, following Britain’s declaration of war. On this day, Gustav Steiner is wiring his agents around Europe. Money has to be moved immediately, bonds and assets transferred, measures taken. The war has come too soon and things are already moving too fast. All of his planning will have to be adapted to a new timetable. The Germans will begin pressuring him soon – they will want weapons, vehicles, steel at the very least, which he has no intention of selling to them. Without the aid of a diplomatic shield of some kind, the French will simply requisition his operations in Marseilles, Lille and Brest, and the British will confiscate his assets around the world in an effort to strong-arm him into helping them. He summons his clerks and begins drafting letters to ambassadors Herrick, Sharp, Page, Gerard and Penfield, to plead his case. Harbert Pencroft and his friends are gathered around the new soda fountain at the M.E. Smith drugstore in Winterset, Iowa. To his astonishment, they are already talking about sailing to Europe to join the fight. The most astute among them predict that if Britain enters the war, so will Canada, which will simplify things for them as they won’t have to travel quite as far to volunteer. They will fake their names if they have to, though Canada will likely be forced to create foreign regiments to meet the demand for fighting men. Harbert says nothing. He is conflicted. While not a coward, he abhors the notion of war and doesn’t understand the impulse to glorify it. When they ask him if he will go with them, he smiles. They see in his reaction what they want to see and continue their celebration. They are as jubilant as the crowds gathering in Paris and London. They all believe that they are on the eve of a great adventure. At La Bretelle, Alexandra Meade watches with concern as her usually stern governess, Frau Grüben, reads the latest news from Europe. Overcome by worry, she stops in mid article and puts the newspaper down. The gloss of her eyes shivers in the light of the window. She can’t go on. She has brothers and nephews in Cologne, Alexandra knows. They will have been mobilized by now. Germany would do well enough in a war against Russia or France or Britain, but all three? The severe facade crumbles before Alexandra’s eyes. It almost brings her to tears to see it. She moves to comfort her – a hand on her arm, perhaps even a hug. Contemptuous of familiarity, Frau Grüben pulls away. The gesture comes across as more than it is but exposes the chasm between them, borne as much of outdated notions of Teutonic propriety as circumstance. Still, something passes between them. The matron’s eyes flash sad and remorseful at the gesture, embarrassed also. For an instant, her lips part as if about to say something, but she thinks better of it. With all the dignity she can muster, the portly governess rises from her chair and sets the newspaper down. Her eyes furtively avoid Alexandra’s as she clears her throat and runs her hands over the front of her dress to brush away the wrinkles. Instinctively, she glances around the room to see if anyone is watching before excusing herself. In that moment, Alexandra glimpses their mutual isolation, and, curiously, a hint of fear also, which she believed was hers alone. Perhaps there is more to Frau Grüben’s situation than meets the eye. Perhaps she too is a prisoner, in her own manner. On the other side of the world, Liva Khan is lying on one of her father’s divans, listening as he reads Jules Verne’s Le Tour Du Monde en 80 Jours aloud. He used to read to her almost every night when she was little. She misses that. The bass of his voice, the exaggerated intonations, the goofy character voices he sometimes created to make her laugh. She wishes there were more moments like those between them now, moments of simple complicity when all veils could be lifted, when they could just be together, father and daughter, without the world and men’s schemes getting between them. The moment is all the more precious for its rarity these days. Why must things always change, she wonders. Why must time always have its hand in our pockets? This is not the right thinking, she realizes. She is here now. Worrying about the future is what invites time’s larcenous hand to begin with. Being in the moment is the only weapon she has against it, at least until she can find a more effective remedy. She closes her eyes and lets Verne’s words glide over her. She tries not to smile at the valiant effort her dear father always puts into his French accent but she can’t stop herself. She chuckles. She hears the smile in his voice as he continues to read. He too is happy, though he will never actually admit it. In London, Lieutenant Archie Whitfield has just declined to accept the Directory of Military Intelligence’s mission, and is on his way back to his regiment’s headquarters. If there is to be a war, his place is in the fight with his men, not safely five thousand miles away on some pointless spy’s errand. Outside his cab, the streets are packed with people. The pubs are filled to the brim. The cool evening air is alive with song and cheer and raucous laughter. He wonders what they are all celebrating, exactly. What do they think war is? They must not have thought it through. The graves, the hospitals, the shattered lives. He shrinks back to the safety of the cab’s shadows and looks away. With any luck, it will be a short war, but who is he kidding? He knows it won’t be. The Germans are all in this time. Whatever they have in mind, it doesn’t involve a quick resolution. They won’t be satisfied with another Alsace. Once they take Belgium, they won’t stop. Switzerland will be next, then France, and if France falls, how long before the German navy sets its sights on Britain’s coast? They have to be stopped and fast. Preferably in Belgium but in France if need be. Though it won’t help get him to Belgium any faster, he wishes the driver would hurry. The war isn’t an hour old and yet time is already running out. On 3 and 4 August 1914, the events of The Peacemakers (Vol.1 of The Nemesis Engines) are still a year away, but the wheels are already in motion. By the time these characters all reach the battlefields of Europe in Vol.2 (Steel and Bone), the war will have morphed into a massive death factory, the front lines will have become meat grinders, and terrifying new weapons, which promised to put an end to the conflict quickly and usher an age of modernity and peace, will only serve to make the war more brutal and nightmarish. Vol.2 of The Nemesis Engines is scheduled for release this winter but you can get started with Vol.1 today. It’s the prefect summer read, and all the more interesting with the centennial of the First World War happening right now. PS: If you like it, don’t forget to leave a review on Amazon and tell someone about it.